Cameron Bulger poses with one of the pins he handed out at a Canadian Blood Services centre in Vancouver on Wednesday, Dec. 5, 2018. A seven-year-old and his family gave a heartfelt thanks to blood donors at a clinic in Vancouver Wednesday. Cameron Bulger was diagnosed with an embryonal tumour, and in his short life has had to undergo brain surgery, six rounds of chemotherapy, three stem cell transplants and proton radiation therapy. He's also received more than 50 transfusions of blood and blood products throughout his treatement. The boy's scans recently showed no evidence of cancer, and he's now officially done treatment. However, he will continue to require regular checkups to ensure he stays cancer-free. 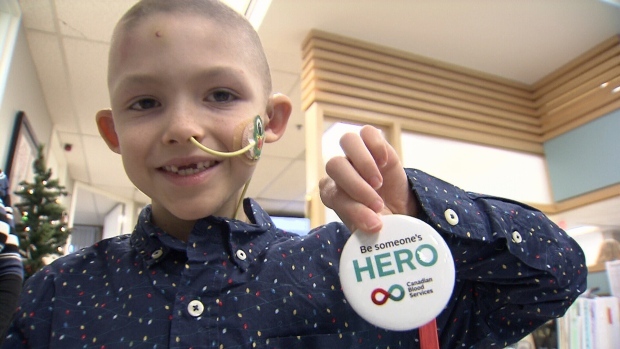 At a Canadian Blood Services centre in downtown Vancouver, the pint-sized patient and his mother, Sharon, passed out candy canes and thanked those at the facility to give blood. "I wouldn't have survived without people donating blood," he told reporters. Sharon said they've seen first-hand how donations can save lives, and that they're grateful to those who gave to her son. The family is hopeful Cameron's story will inspire others to donate. "You should donate blood whenever you can, because it can help a lot of people who need blood to get through cancer or whatever they're dealing with," Cameron said. For more information on donating blood, plasma, stem cells and organs visit the Canadian Blood Services website.